There were quite a few moments this week when various characters, especially Matt and Stefan, had the opportunity to look nonplussed. And they had good reason: how are we supposed to react to Lily’s history with Julian? To Julian himself? To Caroline’s situation? It’s all madness. Madness, I say! Of course, it’s always madness on TVD. The problem is, this madness seems to be taking its time. Each of the three main plots boiled down to wheel-spinning. All those spun wheels might be setting us up for something—and I hope they’re setting us up for the flashforwards—but this episode left me wishing more had happened. It felt, as Damon said, pointless. With pie. More did happen in the A-plot. Stefan’s fake-out with the “Martha Stewart strategy” for convincing his mother to kill Julian started off weird (family reunion) and got weirder (him tying her to a chair while lecturing her on her own history of being with abusive men). The result, though, is that Lily is now playing for Team Salvatore, which is where she should have been in the first place. The C-plot was Lily-adjacent. Julian tethered his life to hers, which made Enzo’s desire to kill him deeply ironic. That Enzo didn’t succeed—since the sword only kills vampires when the stone is in it, like a hard drive of death—is just dumb luck. 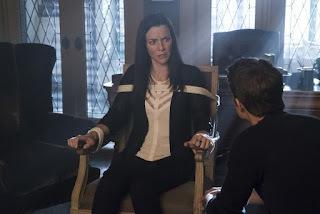 This vamp-slaying sword is smallish (evoking the great line from Buffy’s seventh season: “Scythe does matter”) but deadly, and appears to be the same knife the mysterious “Miss Stabby Pants” is using in the flashforwards. It’s those flashforwards that are keeping me going with this show. I’m so curious to see who Miss Stabby Pants is. Valerie? Lily? Some woman who dropped off the radar a while ago but might come back? Someone we haven’t met yet? Lots of possibilities to ponder while we eat our pointless pie. • Dallas?! Caroline’s in Dallas? • Damon had a pet turkey?! A pet turkey? • I wonder what’s up with the humans in Mystic Falls. Why would the heretics feed them but not feed on them? • The flashbacks were clunky this week. The dialogue and the acting were both quite stilted. Two out of four pet turkeys. Yum! So Lily, Damon and Stefan are now teamed up to murder the guy that took their father's place. Not working out any trauma at all there. If this episode was another attempt to make us like Lily or make the Heretic plot work, no and no. It did make me like Enzo more. And as always, I loved Damon being funny, angry, hurt, and matricidal. "Did you come back to get your dish?" made me roar, I'm not sure why. And I loved that little Damon had a pet turkey. Why did they do flashbacks by candlelight? I think they wanted it to look realistic, but it just looked weird. I'm really enjoying the Alaric Caroline baby thing. No idea why. It's so random. Maybe that's it.